I seriously have cravings for Korean soup, sometimes. But today was different, my family, aunt and cousin went to eat an early lunch because we had plans for the day, so we needed an early lunch. I L O V E this place, everything is just right. I would call it a fast food – but sit down restaurant. There are usually line ups, depending on what time you go, but this place is ALWAYS busy. There are about 10 dishes on the menu, and I basically order the same thing. The dishes are big/ small enough for one person. I usually order the vegetable soon tofu. And each soup comes with a pot of purple rice. The bonus, unlimited Korean appetizers! 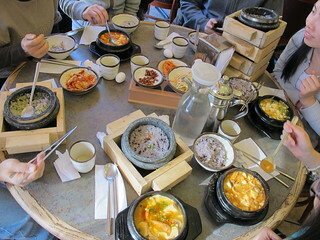 We went to the Finch location, as there is another restaurant downtown near Korean Town.